And gather him fame till there are no more men. Gordon Bottomley was influenced by Pre-Raphaelites such as Dante Gabriel Rossetti and William Morris. Like Morris’s work, Bottomley’s draws on medieval sensibilities. His poetry is driven by a strong command of meter and atmospheric imagery. Like many of the Pre-Raphaelites, Bottomley was a pastoralist, anxious about the Industrial Revolution and the havoc it continued to wreak on the English environment and social equity. Bottomley was known for his verse plays, such as Midsummer Eve and The Riding to Lithend. While he enjoyed some success, his work, like that of many Georgian poets and artists, lost favor after the madness of The Great War. The world no longer swayed to the rhythm of a single heroic death. James J. Guthrie (1874-1952), a Scotsman raised in London, and, like Bottomley, inspired by William Morris, founded Pear Tree Press in 1899 while he was living at Pear Tree Cottage in Ingrave, Essex, England. Guthrie moved the press to Shorne in Kent, then Harting in Sussex, before settling at Flansham, near Bognor Regis, Sussex in 1907. 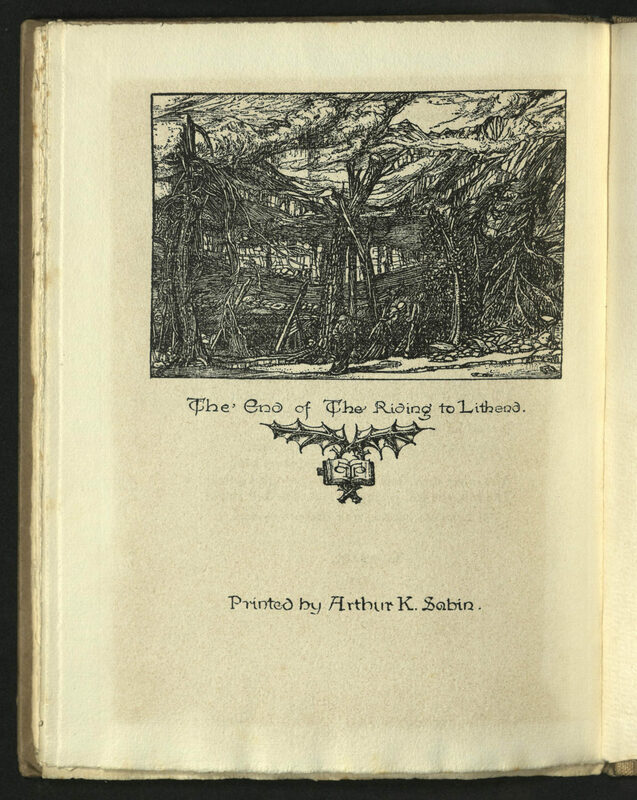 The first book issued by his Pear Tree Press was Some Poems of Edgar Allan Poe, 1901. Guthrie set type, printed and made drawings and wood engravings for the press. 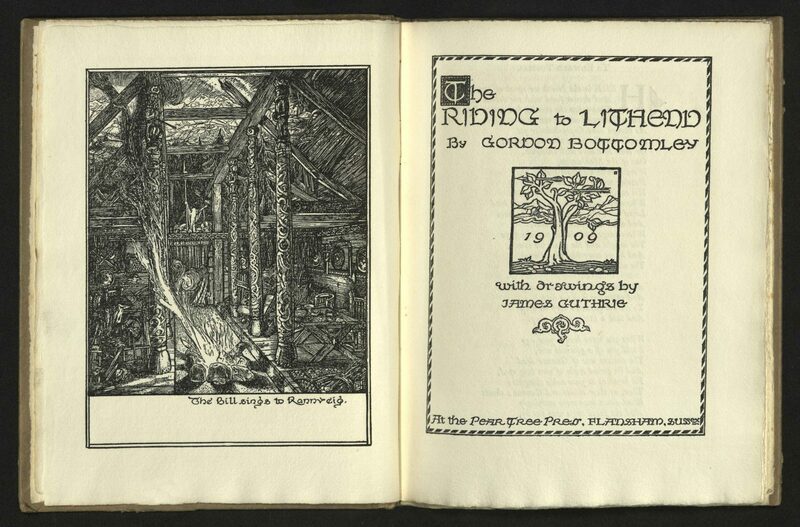 Guthrie made the drawings for The Riding to Lithen, but the book was printed by Arthur Knowles Sabin (1879-1959), also a poet. The same year he printed this book, Sabin took up a post as Keeper at the Victoria and Albert Museum and established his own press. Presentation copy from Sybil Waller to “Mrs. Fowler.” Sybil Waller was the daughter of Pickford Waller (1849-1930), a bookplate artist and an illustrator for Pear Tree Press. 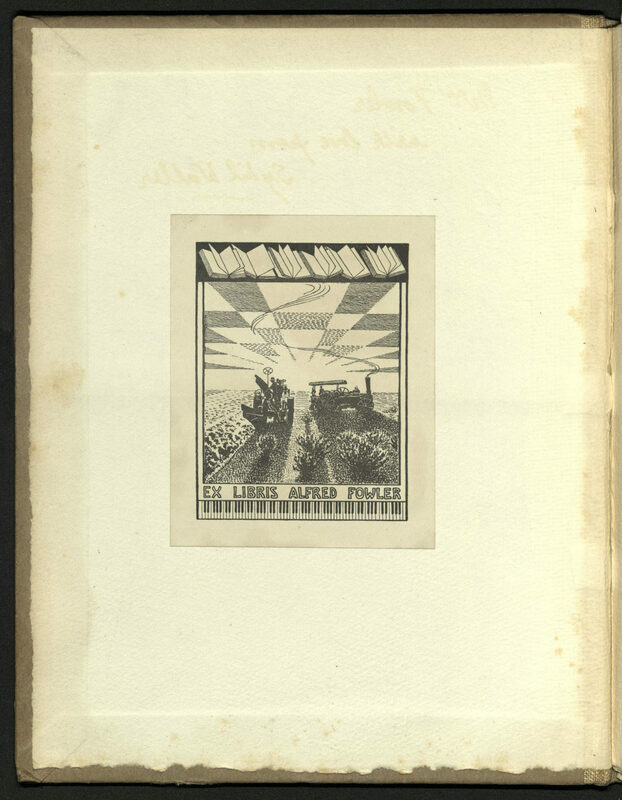 Our copy has the bookplate of Alfred Fowler, author of a publication on bookplates. Fowler’s bookplate here does not appear to be one of Pickford Waller’s. Quarter tan linen over brown paper boards, printed paper label on front cover. Edition of one hundred and twenty copies.